The world just entered the year 2019, but Marvel is already looking forward to 2020. 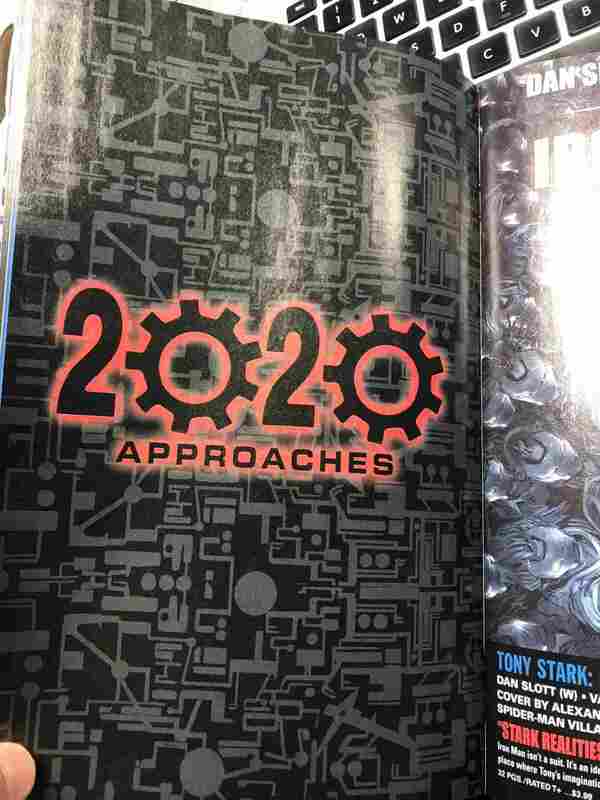 Marvel ran a promo in the latest installment of the Marvel Previews catalog that reads “2020 is coming.” The use of gears for the zeroes in 2020, the tech-themed background, and placement next to Tony Stark: Iron Man in the catalog suggest the ad is related to Arno Stark, aka Iron Man 2020. With the year 2020 less than 365 days away, it makes sense that Marvel would want to do something special for the Iron Man of that era. Tom DeFalco and Herb Trimpe created Arno Stark. The character first appeared in Machine Man 2020 #2 in 1984. As originally conceived, Arno was Tony Stark’s first cousin, once removed. He inherited Stark Industries and the Iron Man armor. Rather than use the armor for the good of all the way Tony did, Arno used Iron Man as an agent of corporate espionage and as a mercenary. During the Marvel NOW! era, Kieron Gillen and Dale Eaglesham created another version of Arno Stark who exists in the present day of the Earth-616 timeline. Tony Stark only discovered that Arno existed recently. In doing so, Tony discovered that he was adopted and that Arno was Howard and Maria’s biological son. Arno’s birth involved genetic tampering by aliens and his destiny to pilot the Godkiller armor. Though ill, Arno piloted his own set of armor to fight alongside his adoptive brother in defense of Troy, a utopian city built by Tony. When he left Troy, Tony left Arno in charge of the city. Arno recently returned to the fore in Tony Stark: Iron Man #5, an issue that focused almost entirely on Arno rather than the titular hero. Could this be seeding this to come? Could we see the Arno of Earth-616 become Iron Man in 2020? Or will Earth-616 Arno come face to face with his alternate future self? And what does any of this mean for Tony Stark? Fans will have to wait and see. Are you excited about the return of Iron Man 2020? What do you think the new Iron Man 2020 event Marvel Comics will be? Let us know in the comments! If you want to catch up with Arno Stark, Tony Stark: Iron Man #5 is on sale now. The issue is also included in Tony Stark: Iron Man Vol. 1: Self-Made Man, which is also on sale now. The classic adventures of the original Arno Stark are collected in the Iron Man 2020 trade paperback.